Join us this Autumn for a thrilling double mountain adventure weekend - look out for rare wildlife, summit the highest mountain in the UK and get another 1,000m peak under your belt as you explore the remote and majestic Scottish Highlands. At 1345m above sea level, Ben Nevis is the highest mountain in the British Isles and reaching its summit is surely on everyone's bucket list! Using qualified and experienced mountain guides, Explorers Connect can help you tick this one as well as a second 1000m+ peak in the Glencoe valley. The main route up Ben Nevis is called the 'tourist track' but don't let the name fool you; the path has around 1300m of ascent and descent and is approximately a 16km (10 mile) round trip. It will take you between six to nine hours and is achievable by anyone who's done some hillwalking or other exercise. On your second day you'll get to tackle one of the many other Scottish mountains that break the 1000m height barrier. You'll be staying in a remote bunkhouse in the steep-sided Glencoe valley. The area is known for waterfalls and trails that climb peaks such as Buachaille Etive Mor and Bidean nam Bian. In the nearby village, Glencoe Folk Museum occupies 18th-century thatched cottages, with displays on local heritage and the Glencoe massacre of 1692. Wildlife in the area includes red deer and golden eagles. You don't need to be super fit to take part in this weekend although you'll get a lot more enjoyment from it if you are familiar with hiking in the mountains. Please check the kit list to ensure you have at the very least a pair or worn-in walking boots and waterproofs! You're welcome to arrive at the accommodation from 6pm on the Friday where your EC host Alex will be there to meet you. She'll show you around the bunkhouse, allocate you a bed and then you'll have the evening to settle in and get to know your fellow walkers - if you fancy it you can also go for an evening ramble. The plan for the weekend is to summit Ben Nevis, the highest mountain in the UK plus another 1,000m+ mountain in Glencoe either as one group of 12 or in two smaller groups of 6. The routes each day will very much depend on the weather and ability and will be decided by your mountain guides - we'll do everything we can to summit Ben Nevis on Saturday but we may have to find an alternative peak if the weather turns against us! On Saturday evening, Alex will prepare a home-cooked dinner in the bunkhouse and on Sunday evening you'll walk to the famous Clachaig Inn for a final goodbye dinner. We'll be leaving the accommodation by 10:00am on Monday morning, but if you're keen to spend another day in the mountains before heading home you can - your guides can give you plenty of hiking route suggestions. 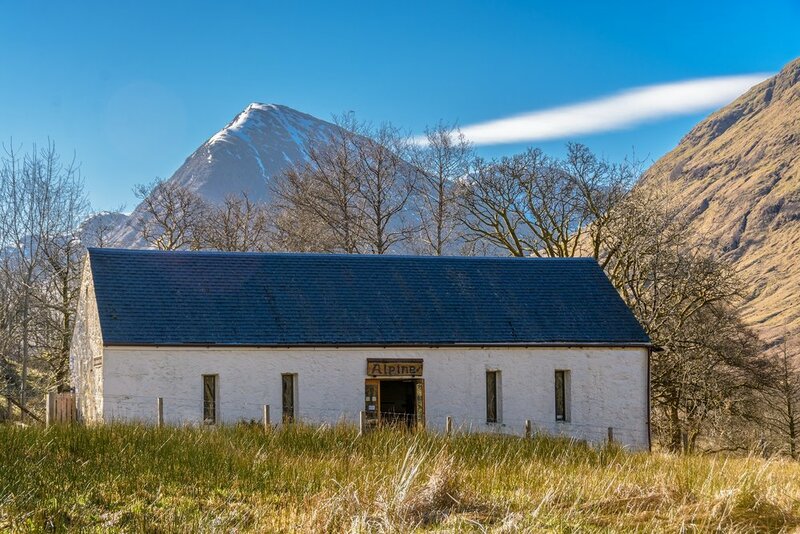 You'll be staying in a cosy Alpine bunkhouse in a secluded setting a short drive from the main A82 just outside Glencoe and 30 minutes from Fort William. A short walk down the road is the famous Clachaig Inn known by climbers and hikers worldwide. Originally a barn on the farming croft, it's undergone a major refurbishment and offers three heated bedrooms sleeping up to 16 guests. Bed linen is included but you will need to bring a towel. Facilities include a communal area for dining, relaxing and cooking as well as access to a drying room with commercial de-humidifier. The bunkhouse has three toilets, hand basins and two showers. Glencoe is around 30 minutes drive south of Fort William on the West Coast of the Scottish Highlands. The most exciting way to arrive is on the Caledonian Sleeper which travels overnight from London and a few other English stations. Car hire is available from Fort William railway station. It's also possible to fly to Glasgow and then hire a car for the two hour drive north. Buses are also available from Glasgow Airport and between Fort William and Glencoe. Download our recommended kit list HERE. If you're an experienced mountaineer / hill walker you can adapt this to your personal preference - but waterproofs and sturdy, worn-in hiking boots are essential for all. Please note we are not including the group dinner out at the Claichaig Inn on Sunday night. You'll need to pay a £100 deposit when booking with the balance due eight weeks before the weekend.